Rediff.com » Business » Small town India is now clad in Armani, Gucci! Small town India is now clad in Armani, Gucci! A new business has emerged thanks to the fashion aspirations of Indians in small towns. Some online shopping sites are bringing national and global luxury brands within the reach of these people at throwaway prices. A couple of years ago, 34-year-old Pankaj Maithil, a businessman and also a collector of designer perfumes from Indore, had to travel abroad or to Delhi to add volumes to his collection. Today, the best fragrances from around the world are just a mouse click away from him. Thanks to the boom in online shopping sites. Inder Goyal, a 42-year-old engineer from Jodhpur, loves to indulge in buying high-end labels like Versace and Armani and Gucci. And now, living in a Tier-2 city he fulfils his passion of following the global trends with the help of his laptop. For Frainy Singh, former Mrs India and now settled in Chandigarh, online shopping is a blessing. Earlier, she had to make frequent shopping trips to bigger cities to maintain her glamorous lifestyle. Now she can do the same even without stepping out of her home. All this has been made possible by a gamut of online fashion retail web sites that have been launched in India in the last couple of years. 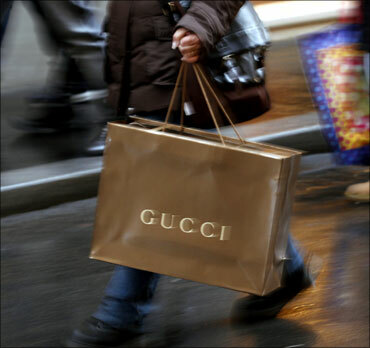 Both Indian and international luxury brands can be bought at throwaway prices on these sites. Fashionandyou, 99labels, Brandmile, DesiCouture and Privatesales are some names that are getting popular among the fashion-conscious Indians. These sites also offer good discounts for the customers. Davidoff Cool Water perfume priced at Rs 4,000 can be grabbed at Rs 1,800, a Calvin Klein dress priced at Rs 7,000 is available for Rs 3,000 and Polo Ralph Lauren T-Shirts with a regular price range of Rs 4,000-5,000 can be bought for less than Rs 2,000. Click NEXT to read on . . .
"With the advent of cable television and the Internet, we see an entire generation which is aware of global trends and brands, and aspires towards them. But the thought of steep prices inhibits their decisions to indulge. Our proposition of affordable luxury is definitely attractive to a vast majority of consumers," said Pearl Uppal, founder and CEO of Fashionandyou.com. While people living in the metros have had the access to many of these brands for a long time, it is in the Tier-2 and Tier-3 cities that the real revolution is taking place owing to the sudden increase in accessibility and affordability of luxury goods. 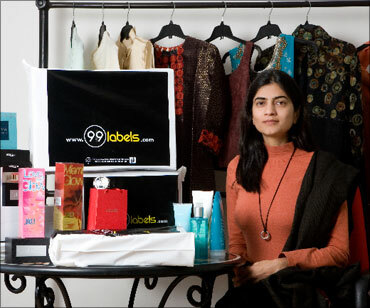 According to Ishita Swarup, CEO and founder of 99labels.com, there is pent up demand in these cities, "Our member base already includes men and women from far off places like Hazaribagh, Andaman Nicobar, Hajipur, Aizawl, etc. Currently, 30 per cent of our buyer base is from Tier-2 and Tier-3 cities. Non-availability of brands in smaller towns such as Dimapur, Rourkela, Salem, Lakua and more makes online sale a lucrative proposition." Uppal too confirms this trend of small town buyers lapping up high fashion lifestyle brands online,"Tier-2 and Tier-3 cities are as globally brand aware as any other city in India. Fashionandyou attracts 40 per cent of its shoppers from other than the top 10 cities in India. We have had a flurry of demand from various parts of the country. The north and the north-east being the most interested in branded goods, followed by cities in the south of India." Manjula C M, a 29-year-old software engineer from Pune, is a self-confessed online shopaholic who does most of her shopping online. "My first online purchase was a Moschino watch that cost Rs 14,000. I paid using my credit card and was really worried and sceptical till it finally arrived at my doorstep. After that, however, my confidence in online shopping grew and I received wonderful customer service from the site I shop at. Now I have introduced many of my friends to it and they are all hooked to it. In fact a friend who lives in Jhamkhandi in Karnataka now spends much more on luxury goods online than I do," says Manjula. Image: Pearl Uppal, founder and CEO of Fashionandyou.com. According to Uppal and Swarup, brands like D&G, Victoria's Secret, Calvin Klein, Hugo Boss, Boggi, Ritu Kumar and Neeta Lulla are particularly popular in smaller cities. As far as the categories go, fragrances and luxury watches are the highest selling items followed by other accessories, apparel and home furnishing. "This is confirmed by Goyal who likes to indulge in creations of Manish Malhotra and Neeta Lulla among others. "I spend almost 70 per cent of my monthly shopping budget on luxury brands online. Shopping online is cheaper; no wastage of time and you can shop any time of day or night. In fact, it won't be an exaggeration to say that this is the future of shopping," said Goyal. So how do these web sites manage to offer such heavy discount on the high-end labels? Given that online selling is way more cost-efficient than physical on ground retail, these companies are able to create significant savings in real estate and other costs and bring the price benefits to the consumer's wallet. Another reason for these incredible bargains is that the fashion industry usually sells around 40 per cent of its merchandise through various forms of discounts in order to liquidate inventory. "Besides their need for inventory liquidation, luxury and fashion brands in India also need cost-effective means of reaching out to cities where they can't be present in the physical retail format owing to prohibitive real estate costs," says Uppal. "Usually these brands are present only in 3 to 5 cities in India. So we provide a marketing and sales platform for luxury and fashion brands for quick liquidation of overstock and slow moving inventory, as well as give them reach to new markets in India," adds Uppal. 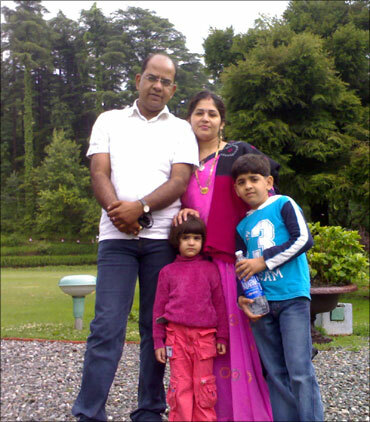 Image: Inder Goyal with his family. One of the biggest disadvantages of online shopping is the lack of touch and feel experience. One has to buy things like clothes and shoes without being able to physically see them and try them on. That is also a reason that international brands are more popular among shoppers as they have standardised sizes. "I am not very comfortable buying Indian brands as more often than not, the clothes need alteration since the sizes are not standard," said Manjula. Swarup admits that this barrier exists but is confident that with good communication tools, web sites can overcome this handicap. "We have incorporated various features on our web site to help customers make a better decision. These features range from extra zoom options to highlighting the detailing on fabric and design to showing products shot from different angles. And with a 'no questions asked' return policy, touch and feel barrier is all but broken," she adds. 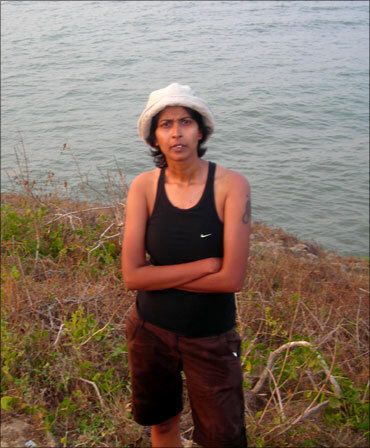 Image: Ishita Swarup, CEO and founder of 99labels.com. As far as the mode of payment is concerned, most men are comfortable using credit cards and women prefer the cash-on-delivery option. And a significant number of customers for these online fashion retail stores are women. "Even though Internet shopping has been considered a male-dominated activity, we have seen a predominant shift towards women buyers on 99labels. Almost 60 per cent of our buyers are women," said Swarup. So are women and fashion going to lead the new growth phase of e-commerce in India? Are small towns going to play a big role here? Are we looking at an inflection point for online buying in the country? "Compared to markets abroad where the online shopping phenomenon is a rage, the Indian online fashion market is nascent but is catching up fast and has great potential for unprecedented growth," said Uppal. She believes that online retail will be 15 to 20 per cent of luxury and high fashion products sales in India in 2-3 years from now.